The Federal District is a vast region in Brazil’s central highland plains, home to an architectural masterpiece, the capital city Brasília. Explore a fascinating cityscape of modernist architecture, unwind in beautiful parks and sail across a huge artificial lake. Brasília is the Federal District’s main attraction. The city was founded in 1960 when the government decided to move the capital from Rio de Janeiro. Brasília was built in under 4 years by architects Oscar Niemeyer and Lúcio Costa and for architecture fans, there is a lot to see. A good place to start is the Square of the Three Powers, the location of key government buildings. Admire the futuristic designs of the Federal Supreme Court, the National Congress and the Palácio do Planalto. Here, you will find the national flag of Brazil, said to be the largest flag in the world in continuous use. The Square of the Three Powers is at the start of the Monumental Axis, the huge central avenue that is lined with many of the city’s most intriguing structures. Browse art exhibitions at the National Museum of the Republic, a white dome-shaped edifice that some say resembles a UFO. Climb the TV Tower for the views and visit the Cathedral of Brasília, a remarkable building formed by curved columns of concrete. For some relaxation, enjoy the picturesque grounds of the Parque da Cidade (City Park) in the center of Brasília. Stroll, jog or cycle along its paths and picnic by the lake. There are more recreational opportunities over at Paranoá Lake, a large artificial body of water on the eastern edge of the city. Take part in many aquatic pursuits, including sailing and Jet Skiing. Drive for about 6 miles (10 kilometers) outside of the city for the Brasília National Park. Hike through woodlands, across grassland and by streams and look for wildlife, such as deer, anteaters and armadillos. Reach the Federal District by flying into Brasília International Airport. A rental car is the most convenient way to get around, but some places including those areas of greatest architectural interest, are served by public transport. Admire the outstanding and innovative architecture of this beautiful building and then venture inside for art exhibitions, movies and theatrical performances. Bring the kids to this wide, open parkland in the center of Brasília, where you’ll find playgrounds, an amusement park and paths for long walks. One of the most recognizable structures in Brasília is a theater complex with a flamboyant pyramidal design and a roster of exhilarating theatrical productions and concerts. Feel the power of space and light in this monument to the utopian dream of St. Dom Bosco. Take a tour of Brasília’s ministry of external relations and see works of art and one of the Federal District’s architectural masterpieces. Whether photographing, walking or driving into the city, don’t miss one of Brasília’s favorite constructions within a city of architectural brilliance. A fascinating memorial building shaped like a dove honors a politician who died before his presidential inaugural ceremony. Find a place for quiet reflection in one of the most colorful, open and modern cathedrals in the world. Spend some time in the governmental heart of the capital, which showcases significant history, informative tours and awesome architecture. Enjoy the books and history of this cultural landmark housed in a fascinating block-themed building. Attend art exhibitions and watch movies inside a captivating building that resembles a UFO. Admire the architecture and learn about Brazilian art. Survey the architectural features of this extraordinary concrete and glass building that has mini waterfalls cascading from one of its façades. Appreciate modern style and simple elegance in design while you learn about the office of Brazil’s most important figure. See Brasília’s official state buildings and one of the world’s largest national flags at this impressive plaza, home to three branches of government. Tour the chambers and study the architecture of this futuristic-looking court building on the Three Powers Plaza. Located in Asa Norte, this luxury hotel is within 1 mi (2 km) of Lake Paranoa, Mane Garrincha Stadium, and Sarah Kubitschek Hospital. Brasilia Shopping Center and Brasilia TV Tower are also within 10 minutes. Central Station is 16 minutes by foot and Galeria Station is 21 minutes. 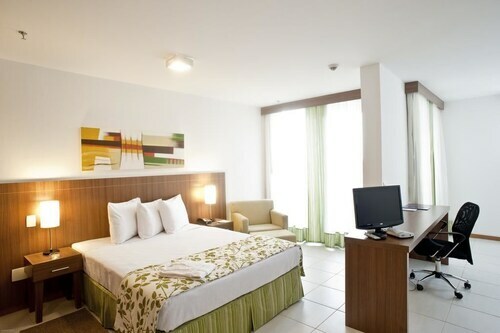 Located in Asa Norte, this hotel is within 1 mi (2 km) of Brasilia Shopping Center and Mane Garrincha Stadium. Dom Bosco Sanctuary and National Congress of Brazil are also within 3 mi (5 km). Central Station is 16 minutes by foot and Galeria Station is 22 minutes. Located in Asa Sul, this hotel is within a 15-minute walk of Lake Paranoa and Sarah Kubitschek Hospital. Mane Garrincha Stadium is 1.4 mi (2.2 km) away. Galeria Station is 7 minutes by foot and Central Station is 14 minutes. Located in Setor Hoteleiro Norte, this hotel is within 1 mi (2 km) of Lake Paranoa, Mane Garrincha Stadium, and Sarah Kubitschek Hospital. Brasilia Shopping Center and Brasilia TV Tower are also within 10 minutes. Central Station is 17 minutes by foot and Galeria Station is 19 minutes. 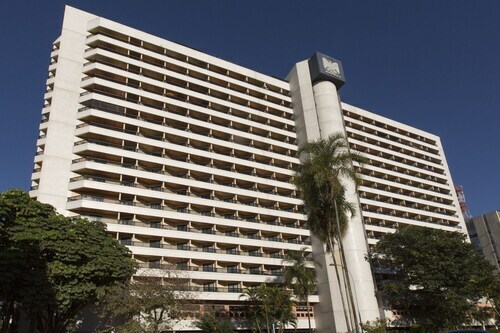 Situated in Brasilia, this luxury hotel is within a 15-minute walk of Lake Paranoa and Alvorada Palace. Planalto Palace and Square of the Three Powers are also within 3 mi (5 km). 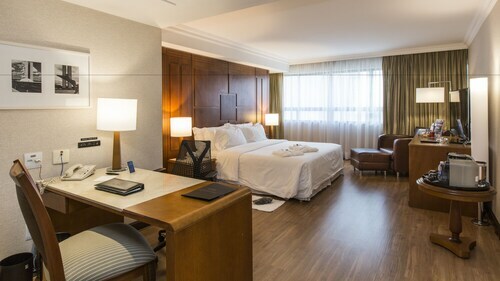 Located in Setor Hoteleiro Sul, this luxury hotel is within 1 mi (2 km) of Brasilia TV Tower, Mane Garrincha Stadium, and National Museum of the Republic. City Park and Metropolitan Cathedral are also within 2 mi (3 km). Galeria Station is 18 minutes by foot and Central Station is 21 minutes. 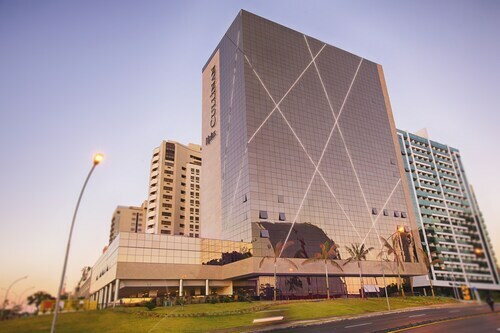 Located in Asa Norte, this hotel is within 1 mi (2 km) of Lake Paranoa, Sarah Kubitschek Hospital, and Mane Garrincha Stadium. Liberty Mall and Conjunto National Mall are also within 10 minutes. Central Station is 13 minutes by foot and Galeria Station is 15 minutes. Located in Asa Sul, this hotel is within a 15-minute walk of Lake Paranoa and Sarah Kubitschek Hospital. Mane Garrincha Stadium is 1.3 mi (2.1 km) away. Galeria Station is 11 minutes by foot and Central Station is 17 minutes.